A Senate panel approved a controversial abortion bill Wednesday regarding the rare cases of infants who survive the procedure. It's one of three anti-abortion bills that Lt. Gov. Dan Patrick has listed among his priorities. All three have been approved by committees and sent to the full Senate. The Senate Health and Human Services Committee approved the infant protection bill with a 6 to 2 vote. Senate Bill 23, filed by Sen. Lois Kolkhorst, the committee chair, gives teeth to an already existing statute that grants legal protections to children born after a failed abortion attempt. Doctors who fail to provide appropriate medical treatment would be charged with a third-degree felony and have to pay a fine of at least $100,000. The bill is part of a national Republican response to abortion advocates' efforts to roll back regulations on late-term abortions in states like New York and Virginia. The U.S. Senate rejected a national version of SB 23 last month, which prompted the state-level response in Texas. “Where Washington D.C. has been unclear, we're going to be very clear. Texans stand united for life,” Kolkhorst, a Republican from Brenham, said in a statement. Legislators and advocates who support abortion rights, however, say that the practice is very rare and unfairly criminalizes doctors. Texas reported zero live births resulting from an abortion between 2013, when the Department of State Health Services started collecting the data, and 2016, the most recent year for which data is available. State Rep. Jeff Leach, R-Plano, authored the lower chamber's companion bill that was debated Monday. Leach said he expects his Judiciary and Civil Jurisprudence Committee to send his version of the legislation to the full House soon. Meanwhile, another of Patrick’s priority bills, Senate Bill 22, would prohibit state and local governments from funding abortion providers. The bill from state Sen. Donna Campbell, R-New Braunfels, is the latest in a series of state decisions to slash government funding for abortion providers in Texas. In 2011, the Legislature cut the state’s family planning budget by two-thirds in an effort to limit funding for abortion providers like Planned Parenthood. In late 2016, the state kicked Planned Parenthood out of the state’s Medicaid program and cut off $3.1 million in funding — and a federal appeals court upheld that decision in January. These efforts, however, don’t affect funding at the local level — which SB 22 seeks to change. Anti-abortion legislators singled out the Planned Parenthood’s downtown Austin clinic, which the city leases to the organization at a very low rate — a relationship that may be severed if SB 22 becomes law. “Now I don’t know anyone who can get that kind of a real estate in Austin,” Campbell said during the bill’s hearing. Nicole Hudgens, the senior policy analyst for the Christian organization Texas Values, criticized the “sweetheart rent deal” as unfair to local residents in the East Austin area, who have seen skyrocketing rental prices with increased gentrification. Gutierrez also worried that the language of SB 22, which would limit “transactions” between the government and abortion providers, is too broad. For example, Planned Parenthood has partnered with local health departments to provide condoms in El Paso and Zika prevention kits in the Rio Grande Valley. The Alternatives to Abortion Information Act, Senate Bill 24 proposed by Sen. Eddie Lucio, a Democrat from Brownsville, would clarify an existing statute that requires a patient to receive certain information before getting an abortion, including a list of agencies that offer alternatives to abortion. The Senate State Affairs Committee unanimously approved the bill Monday. SB 24 states that a physician must hand the patient a hard copy of the materials — an important clarification, according to Joe Pojman, the executive director for the Texas Alliance for Life. Current law says the information must be provided in a conversation or online. “The abortion providers are not requesting them from the state. They are free,” Pojman said during the bill’s hearing. "The women are obviously not getting them." Pojman said he requested through the state's Public Information Act the number of brochures shipped to abortion providers last year. He said his request found that fewer than 6,000 informational brochures were sent — far fewer than the number of abortions annually in Texas. There were roughly 55,000 abortions performed in 2016, the most recent year for which state data is available. Gutierrez said that even in this session in which legislative leaders have prioritized “bread-and-butter” topics like school finance and property tax reform, legislators are “more aggressive than ever” on the issue of abortion. On Wednesday night, state Rep. Matt Krause, R-Fort Worth, added an amendment to the 2020-21 state budget that would pump $52 million into the controversial Alternatives to Abortion program, which contracts with providers that refer pregnant women and adoptive parents to social services. "The state budget is about priorities, and my amendment ensures we are serving the most vulnerable in our state. Texas is a Pro-Life state and we must place action behind our convictions," he said. 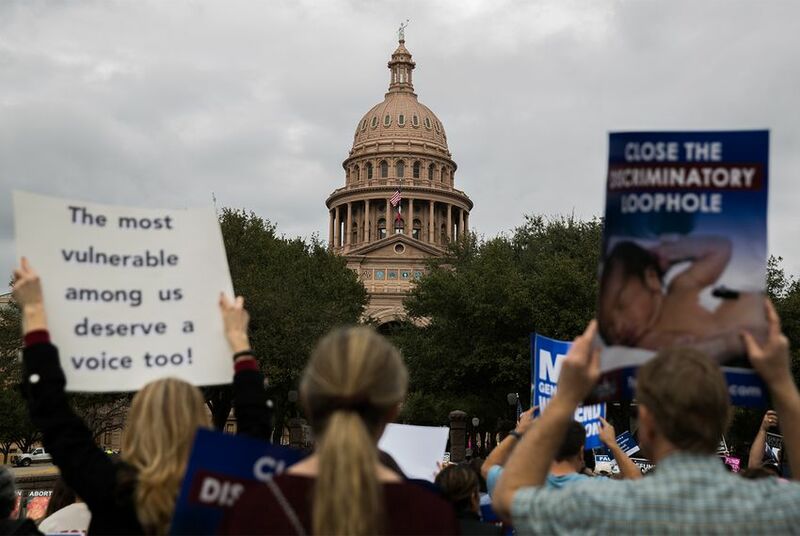 "The funding increase for the Alternatives to Abortion program will allow pending providers to join the program, as well as enable current providers to grow and serve more Texas families in underserved areas." Rep. Ana-Maria Ramos said she visited one of these facilities, and she felt that the staff focused too much on anti-abortion rhetoric. “They were scaring me with information—actually misinformation,” said the Richardson Democrat. Other anti-abortion bills were filed this session but have not received hearings, like the controversial House Bill 1500. The so-called “heartbeat bill,” which would ban abortions once the fetus' heartbeat can be detected, has gained traction across in the nation — and the Mississippi legislature recently passed a version. Correction: A previous version of this story misidentified the lawmaker who visited a facility that contracts with providers that refer pregnant women and adoptive parents to social services.